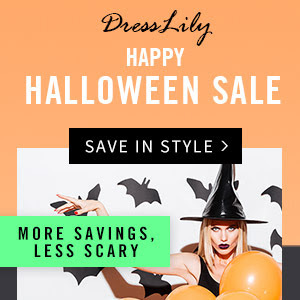 Random Sunday post because I have great news for you all.Dresslily has got a special treat for you this halloween.First of all, I really love this site. I did a Dresslily wishlist just last week. I loved their stuff and now they're having a great sale on a number of items. You can click on the picture to see what's on sale to save more for Halloween but wait , there's more. This is one you really do not want to miss out on .All you've got to do is this. Share this particular post to your social media pages that is Twitter, Facebook, Lookbook, Instagram , e.t.c. This is for a chance to win get this, $100 gift card.Do you know what that means to a lover of fashion like myself? ?I bet you do.You can get some great stuff from them with that.After sharing this on your social media pages, send your social links to blog@dresslily.com .Remember, the more you share the more your chances of winning. Also while you follow me on Instagram, look out for this same picture and read the caption for a chance to win big. I have always been a fan of this site and for some great reason.I highly recommend it.Have you ever shopped at Dresslily before?How was the experience? I have never shopped at Dresslily, I'll surely have a look now! Well Claire you really should.You will not be disappointed.